We’d love your help. 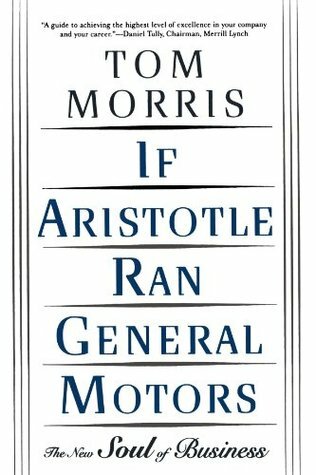 Let us know what’s wrong with this preview of If Aristotle Ran General Motors by Tom Morris. To ask other readers questions about If Aristotle Ran General Motors, please sign up. On Strategy : What managers can learn from great philosophers? This is a clear and concise book on how smart leaders run businesses. The practical application of ethics into everyday life was my favorite part, although Morris' many analogies and stories keep the reader engaged throughout the short read. The author weaves the ancient philosophy of Aristotle, The Bible, Confucius, and many ancient writings to show us that there is "nothing new under the sun" except maybe in our lack of applying wise principles in business. -There is a difference between ethics and morals. Morals is doing the right thing; ethics is to be seen by others doing the right thing to create the perception of morality. Business leaders need to decide which one is more important based on their personal/institutional values. That choice can have significant impacts to bottoms lines, brands, and customer/employee loyalty. -Philosophy is the "love of wisdom"...means keep learning as a lifelong passion for wisdom and truth. An interesting book as the author presented philosophy in a business context. As someone who tries to be aware of morality, there wasn't many new ways of thinking that I hadn't considered before. I know it would be incredibly difficult to do, but I would rather have had more stories about where a company acted in a moral way and it paid off. I think a lot of us like to think that good people and actions will be rewarded later on, but is that actually the case? It would have been more interesting An interesting book as the author presented philosophy in a business context. As someone who tries to be aware of morality, there wasn't many new ways of thinking that I hadn't considered before. Although this was required reading for my MBA course in organizational behavior, I found this not only pertinent to business, but everyday life. Morris has some sage wisdom on how to find individual excellence, which will breed organizational excellence, which will in turn create societal harmony. Although it sounds new age, he uses the teachings of Aristotle and other sage philosophers to illustrate that if they were CEO's today, this is how things would get done. This is the best "business" book I've ever read. Really a treatise on ethics and how philosophy really is relevant to running a business. It took me about 6 months to read because it isn't the type of book you sit down and read all at once. I highly recommend it to anyone in a corporate setting, especially if you play any sort of leadership role. I pretty much completely agree with Morris on his ideas about how business should run--by using principles of Truth, Beauty, Goodness, and Unity. But I felt that I didn't need a whole book on his ideas since in my case, he's preaching to the choir. An essay would have sufficed. However, it's very much a discussion-worthy book. Although Mr. Morris is clearly a devote of the Latinized Aristotle that emerged as a result of Aquinas's integration of the Parapetetic school with Scholastic Christianity, this is still an excellent read. (even though his reading of Aristotle borders on libel) I think the author rightly focuses on the role of ethical virtue in business. In spite of it having good ideas, it also used a bunch of anecdotal evidence as support, instead of, like, actual support. So it was lazy as far as argumentation goes. But some decent nuggets nonetheless. Awesome Book...All readers need to read this really useful and enlightening book. An optional-read biograpy on leadership for knowledge workers, managers, directors, C-levels, and entrepreneurs. An interesting book. A slow slog to read though. Full of so much, but written in a way that makes it somewhat hard to understand on the first reading. Good book on why morals and ethics are very important to creating a very successful business. If corporate America operated under the principles in this book, it would be a better world with a lot less stress. New takes on accepted ethics. Doesn't your workplace need to be aesthetically pleasing to encourage you to best productivity? A native of Durham, North Carolina and a Distinguished Alumnus of Durham Academy, Tom was a Morehead Scholar at the University of North Carolina - Chapel Hill, which has honored him, along with Michael Jordan, as a reci Tom Morris has become one of the most active public philosophers in the world due to his unusual ability to bring the greatest wisdom of the past into the challenges of the present. Tom is also the author of the highly acclaimed and bestselling leadership classic If Aristotle Ran General Motors and the big yellow book, often seen in college dorms nationwide the night before final exams, Philosophy for Dummies. Other more recent books include The Art of Achievement, The Stoic Art of Living and Superheroes and Philosophy, where Superman and Batman finally meet Plato and Aristotle. Tom’s newest bestselling book about life and business is entitled, If Harry Potter Ran General Electric: Leadership Wisdom from the World of the Wizards. It's currently bringing magic into people's lives around the world. Tom’s work has been featured, noticed, commented on, or covered by such diverse news outlets and media as CNN, NBC, CNBC, The Learning Channel (TLC), NPR's "Morning Edition," NPR's "Talk of the Nation," The New York Times, Fast Company, The New York Times Magazine, USA Today, Newsweek, The Los Angeles Times, The Chicago Tribune, The Dallas Morning News, The Washington Post, The Las Vegas Sun, USA Weekly, The Economist, Readers’ Digest, The Globe and Mail, Die Zeit, German Elle, Voce:SA, L'Agefi, ABC.com, The Leaky Cauldron, and many other magazines, newspapers, and websites across the globe.